This chapter centers on two separate yet interrelated questions: (1) How old is the global world? 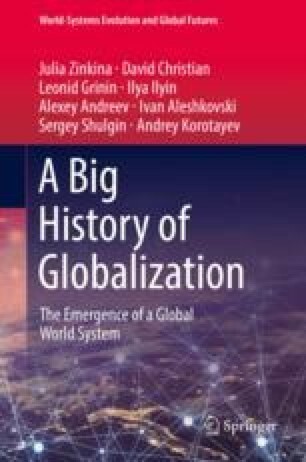 (2) How old is globalization? To answer the first question, we will use a set of criteria developed in the framework of world-systems analysis. As for the second question, in line with existing approaches, we will identify four stages of the history of globalization, namely archaic, proto-modern, modern, and the “newest.” After contextualizing these four general stages in the history of globalization, we will draw upon approaches from physics (phase transitions) and evolutionary biology (typostasis/typogenesis) in order to offer a more detailed periodization of archaic, proto-modern, and modern globalization. This periodization serves as a basis for the general structure of the book, which will also be outlined in this chapter.